When I young, I worked at a local grocery store. To this day, I still get excited about things like grocery pickups and setting up our free market in large part because of my memories working at the grocery store. Over the years that I worked at the store, I worked in many different departments and got to know many different people as well. 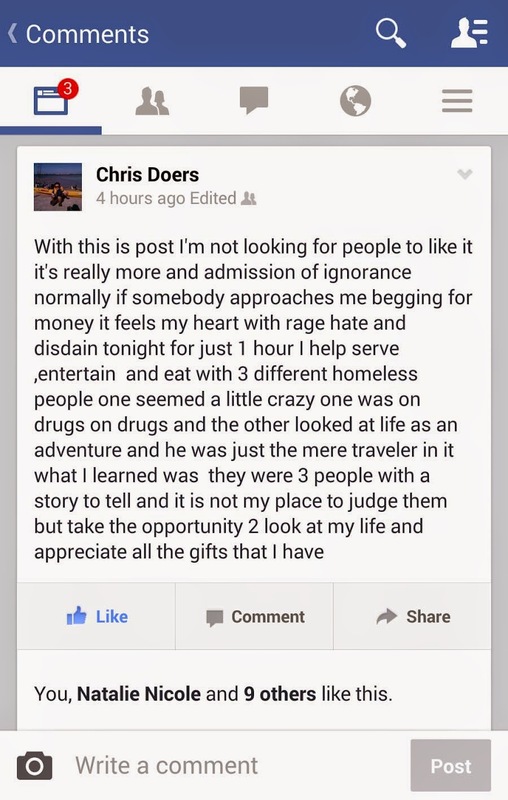 One of the people that I really connected with was my friend Chris Doers. We worked stock together for years and interacted a lot when we were both in different departments too. We would also get together outside of work to go fishing from time to time. Chris was always a good dude that I really enjoyed hanging out with. My car accident, that nearly took my life, happened at age seventeen after a shift at the store. Chris still recalls seeing me that night just hours before the wreck. Not long after my accident, I quit working at the store to focus on college (partying). After just a few years of being away, and after starting to follow Jesus, I came back to work at the store again. Chris was still there and we continued to be friends. We would still fish and talk and hang out pretty often. I eventually began going to a 'house church' at Brian Sanders house, the first house church of what would one day become known as the Underground Network. I think we jokingly referred to ourselves the "underground church" then too. I invited Chris to come over and check it out one night, and he did. I remember him thinking that I was insane, and that our group was a little weird, and the fact that I was about to move to the inner city was just stupid. Needless to say, he wasn't too impressed, but he didn't forget the experience either. Fast forward to 10 years later, and Chris and I have lost touch with one another. Recently he has been getting more involved with his church community, and getting more and more serious about following Jesus himself. The other day he was on the phone with a friend who told him he was on his way to visit the Underground. Chris remembered me and the house church he visited and asked his friend, "You mean that weird church that meets in some dudes house?" His friend replies "Brother, there's a lot of houses now." Chris then set out to hunt me down, which didn't take too long as I heard from a few sources within the next day or two that he was looking for me. We got in touch and he came by. It was great to see this old friend and he reminded me of much of this story from his perspective. He just thought that it was crazy to see what all those insane, weird and stupid choices I was making back in the day have turned into. As we toured the neighborhood, and I showed him the houses and the gardens and all the work being done, he seemed to understand more and more what we were up to. I told him all about the Underground and the work that I now do with The Well, and he promised that he would come visit us at our Thursday night meal called The Banquet. The first night he popped in, I wasn't there but I heard that he came and after the meal, and then I saw this post on Facebook. Just a few weeks later, Chris came back with the whole Doers family. His wife and kids jumped right in to serve and talk with guests and just be here. It was a great night and we were so grateful to have them here with us. That night, after he left, I saw another post on Facebook that honestly made me tear up. Chris posted again about being at the meal, but what he said in his comments communicates exactly the thing that I hope those who join us to serve will take away. While many homeless folks need some dinner and come to meet that need, many of us who serve do not realize the needs that we have that are fulfilled here. I think Chris's comments help illuminate our need a bit, our need that is made known by coming and sitting at the table with others that we otherwise, often, do not see or know. (And by the way, his daughter in the pink/purple dress, is a cage fighter known as The Reaper! "It's amazing you think you're going to go in and help someone that is truly less fortunate then realize the conversation was probably more important to me. It just puts it in perspective how truly blessed my family and I truly are..."
"You know I went into it thinking I was going to do something nice but I honestly believe it's a privilege and a gift that I had the opportunity to be there..."
"I feel that going there once or twice is almost self righteous, opening your doors to complete strangers everyday without question and without prejudice that's a great job." We pray for those who visit us would leave transformed and filled. Challenged in areas of prejudice and entitlement, encouraged toward gratefulness and appreciation, and inspired to open their own doors and lives to those who used to seem so Other. We are in the business of building bridges and Chris is a great example of what we hope for all of our friends to leave with. We expect to see more of him around here but better than that, we know God has done something in him that will go with him to his own neighborhood, church and relationships.